Normally this is the part of the week when I go on a bit about production techniques, grapes, all the rest of it. 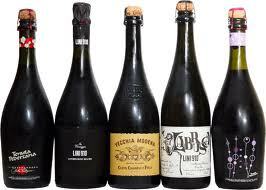 But I think the big thing about Lambrusco is that it’s more about dispelling the myth that’s its horrible cheap stuff. It isn’t, or at least it isn’t anymore. But why listen to me? Why don’t we let the professionals tell us the story? Alice Kilgarriff-Vighi (who I recently had the pleasure of meeting) and Emma Kahan started a Lambrusco importing business (http://www.kilgarriffandkahan.co.uk) in the UK after falling in love with the stuff during lots of time spent over in Emilia Romagna. They’re now at the forefront of the UK resurgence of Lambrusco. “Lambrusco has long been enjoyed in Emilia, accompanying plates of fresh lasagne, tortelli verdi and cured ham. Made using the grapes of one of the oldest known vines in existence – the vinis silvestris (literally, wild vine), this deliciously dry wine has been a staple on Emilian tables for millennia, and is an essential part of their enogastronomical heritage. There you go then, bring it on! I’m fully with you – Lambrusco got a reputation of a cheap sweet plonk, however, I had a number of outstanding Lambrusco wines. By ignoring Lambrusco as a category, people are depriving themselves of lots of pleasant moments. That’s what we’re going for, looking forward to getting stuck in when it gets delivered!